Roma Moulding hosted Canada’s transportation and logistics leader, Purolator, at our world headquarters last month for a special video shoot. Roma Moulding CEO, Tony Gareri meets with Purolator’s President and CEO Patrick Nangle. Roma Moulding opened its doors to the world-renowned company and valued partner at the request of Purolator President and CEO, Patrick Nangle. Nangle attended Roma Moulding’s headquarters to film a special video about the value of partnerships that was presented at the company’s recent stakeholder event. Roma Moulding and Purolator have joined forces to provide unparalleled service and support to all Roma business partners. Additionally, members of Purolator’s industry-leading team were present at Roma Moulding’s most recent All Hands Meeting, AHM12, to accept a special acknowledgement awarded to business partners that assists Roma in its mission to Move, Inspire and Move! 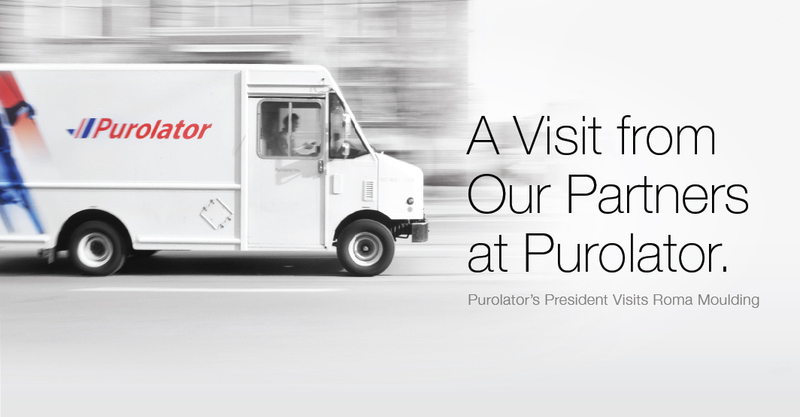 It was a special day and the I loved working with the Purolator crew to make this happen! Great video and an amazing partner! Nice partnership story…really proud to be part of the family!